12 times Princess Charlene and Charlize Theron Looked Like Style Twins! As our Instagram hits the 10,000 followers mark (thanks, everyone! ), I looked back at Princess Charlene's style over the years. And man has A LOT changed since the first time I saw a picture of her. The Princess of Monaco has been in the public eye for 12 years (she started dating Prince Albert publicly in 2006). In these years, Miss Wittstock turned Princess Charlene of Monaco dealt with several stylists, hair and makeup artists, designers, colors, and hair-lengths. The only constant, however, is the fact that she has always looked like another South African belle, Charlize Theron. Sometimes more than other of course, that is why today, I wanted to share with you a dozen times Princess Charlene and Charlize Theron looked freakishly like each other's alter ego! Hairstyle, makeup, earrings, and even features are all almost identical. Princess Charlene wins this one with her amazing purple Ralph Lauren Collection gown and historic jewelry, though! 2. When they both swept their short hair to the side and wore bright makeup! Well, Charlize did it some 5 years earlier, but still! 3. When they both showed their sassy side with a black headband! Charlene wore this headband with an Akris gown for the Rose Ball in 2012, Charlize did it for IFP's 21st Annual Gotham Independent Film Awards. Charlize was subtle with her simple hairstyle and natural makeup at the 2014 Academy Awards in a Dior Couture gown and Harry Winston Jewelry. A year earlier, the Princess of Monaco had the same hairstyle and makeup at the Atelier Versace Spring 2013 show in Paris. 5. On a casual stroll in the US! Put Charlize's bag with Charlene's outfit and you've got a killer look! 6. When they both had messy curls! Left: Charlene Wittstock in a red Terrence Bray dress for the Princess Grace Awards in New York in 2008. Right: Charlize Theron in Dior attending the LA Premiere of A Million Ways To Die In The West. 7. When they both had pixie haircuts and somber looks! Can you spot the Dior Tribal earrings Charlize is wearing? Charlene has them in several variations. 8. When they both went 60's for Dior Haute Couture! The South African beauties both had similar hairstyles wearing Dior. For Charlene, it was to attend the Dior show in 2013, for Charlize it was the Academy Awards in 2006 in Zac Posen-looking Christian Dior gown! 9. When they both took pixie haircuts to the next level, AGAIN! At an interview, Princess Charlene revealed that her mother and Charlize's mother used to go to the same hairdresser in Benoni. 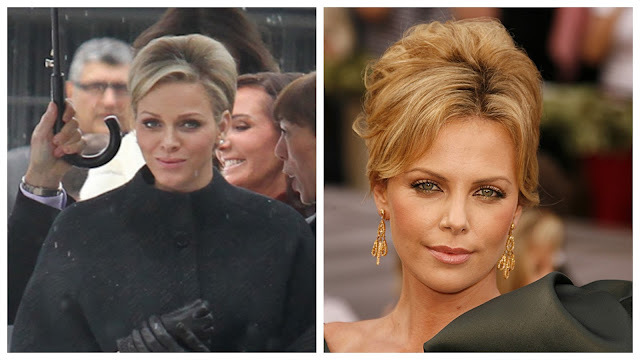 Now you'd think Charlene and Charlize share the same hairdresser themselves (they actually don't). 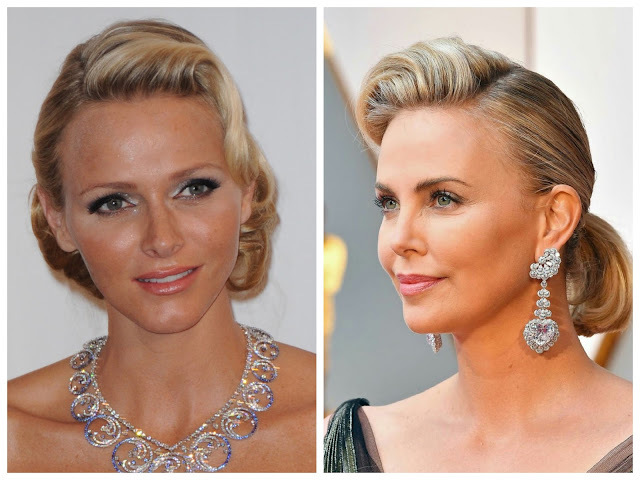 Charlize debuted this fierce hairstyle in 2013 at the Oscars. Princess Charlene followed her footsteps last year and had this very daring buzzcut to attend the AMREF gala in Monaco. 10. When Charlize Channeled Charlene for the Met Gala. Charlize's entire look for the 2014 Met Gala (the James Charles exhibition) reminds me of Charlene. The gown black and white, Charlene's favorite colours. It's strapless. And the jewelry is major yet subtle and understated. Even the hairstyle reminds me of Charlene's visit to Germany in 2012. N.B: Charlene's dress is not Dior, we were wrong all these years! The real question here is: Charlene's Van Cleef and Arpels Ocean Necklace or Charlize's Chopard Garden of Kalahari earrings? 12. When they both wore gold metallic dresses and red lipstick. Have to get this one to Charlene, though. The Ralph Lauren dress is perfection while Charlize's Tom Ford looks like a gold armor, fabulous wargear if you ask me! Do you think there's a strong resemblance between the two South African beauties?